Cysteine is a naturally occurring, sulfur-containing amino acid that is found in most proteins, although only in small quantities. Cysteine is one of the 20 standard amino acids required by human beings and is unique among them in that it contains a thiol group. A thiol group (or sulfhydryl group) is a functional group composed of a sulfur atom and a hydrogen atom (-SH). It is responsible for a number of important functions of cysteine, such as allowing the formation of disulfide bonds that are crucial to defining the structures of many proteins (see biochemistry). The other sulfur-containing amino acid, methionine, cannot form disulfide bonds. Cysteine is often involved in electron-transfer reactions, and helps an enzyme catalyze its reaction. Cysteine is also vital for the intracellular manufacture of the important antioxidant glutathione. N-acetyl-L-cysteine (NAC) is a form of cysteine where an acetyl group is attached to cysteine's nitrogen atom; it is sold as a dietary supplement and used as an ingredient in cough medicine. Human creativity is also reflected in the commercial production and application of cysteine and its derivatives in adding flavor to food, a baking processing aid, and hair care, among other practical applications. A genetic abnormality can impact the normal complex coordination of the human body, resulting in a condition known as cystinuria, where this amino acid forms hard cistine kidney stones. Cystine is an oxidized form of cysteine, involving two cysteine residues liked by a disulfide bond. Cysteine is named after cystine, which comes from the Greek word kustis meaning bladder: cystine was first isolated from kidney stones. Cysteine is a standard amino acid, being required by people for normal functioning. Amino acids, which are the basic structural building blocks of proteins, are organic molecules with three main components: an amino group (-NH2), a carboxylic acid group (-COOH), and an R group, or side chain, unique to each amino acid. Although over 100 amino acids exist in nature, the human body requires about 20 amino acids, called standard amino acids, for normal functioning. Most amino acids occur in two possible optical isomers, called D and L. The L amino acids represent the vast majority of amino acids found in proteins. The naturally occurring form of cysteine is L-cysteine. 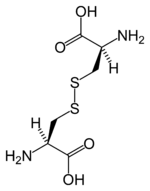 As noted, cysteine is characterized by the presence of a thiol (sulphydry) group (-SH). Since thiol groups can undergo reduction (redox) reactions, cysteine can undergo redox reactions. Oxidation of cysteine can produce a disulfide bond with another thiol. A disulfide bond, also called a SS-bond or disulfide bridge, is a single covalent bond derived from the coupling of thiol groups. The overall connectivity is C-S-S-C. The disulphide bonds of cystine are crucial to defining the structures of many proteins. Disulfide bonds play an important role in the folding and stability of some proteins, by stabilizing the folded form. Extracellularly, by crosslinking proteins, cysteines increase the molecular stability of a protein in the harsh extracellular environment, and also function to confer proteolytic resistance (since protein export is a costly process, minimizing its necessity is advantageous). Intracellularly, disulfide bridges between cysteines within a polypeptide support the protein's secondary structure. Insulin is an example of a protein with cystine crosslinking, where two separate peptide chains are connected by a pair of disulfide bonds. The cysteine thiol group is also a nucleophile (a reagent that forms a chemical bond to its reaction partner by donating both bonding electrons), and can undergo nucleophilic addition and nucleophilic substitution reactions. Thiol groups become much more reactive when they are ionized, and cysteine residues in proteins have acid dissociation constant pKa values close to neutrality, so are often in their reactive thiolate form in the cell (Bulaj et al. 1998). Some important cysteine-derived nucleophiles include ubiquitin ligases, which transfer ubiquitin to its pendant proteins. Ubiquitin is small regulatory protein that is ubiquitous in eukaryotes. Another example are caspases, which engage in proteolysis in the apoptotic cycle. Inteins often function with the help of a catalytic cysteine. These roles are typically limited to the intracellular milieu, where the environment is reducing, and cysteine is not oxidized to cystine. Protein Disulfide Isomerases catalyze the proper formation of disulfide bonds; the cell transfers dehydroascorbic acid to the endoplasmic reticulum which oxidizes the environment. In this environment, cysteines are generally oxidized to cystine and no longer functions as a nucleophile. The thiol group also has a high affinity for heavy metals, and proteins containing cysteine will bind metals such as mercury, lead, and cadmium tightly (Baker and Czarnecki-Maulden 1987). Due to this ability to undergo redox reactions, cysteine has antioxidant properties. Cysteine is an important source of sulfur in human metabolism, and although it is classified as a non-essential amino acid, cysteine may be essential for infants, the elderly, and individuals with certain metabolic diseases or who suffer from malabsorption syndromes. Cysteine is an important precursor in the production of the antioxidant glutathione, which protects cells from toxins, such as free radicals, in the human body and other organisms. The systemic availability of oral glutathione (GSH) is negligible; the vast majority of it must be manufactured intracellularly. Glutathione is a tripeptide antioxidant made up of the three amino acids cysteine, glycine, and glutamate. Glutamate and glycine are readily available in most North American diets, but the availability of cysteine makes it be the rate-limiting substrate for the synthesis of glutathione within the cell. It is the sulfhydryl (thiol) group (SH) of cysteine that serves as proton-donor and is responsible for the biological activity of glutathione (Ammunotec 2007). Sometimes referred to as the “master antioxidant,” glutathione regulates the actions of lesser antioxidants (such as vitamin C and vitamine E), and levels of glutathione in cells are predictive of how long someone will live (Ammunotec 2007). Cysinuria is a genetic disease whereby the body's retention of certain amino acids from excretory pathways is prevented, and these amino acids tend to collect in the urinary tract in higher than normal concentrations (ICF 2007). Cystine tends to form solid crystals that form into rock hard cystine kidney stones (ICF 2007). Cysteine can be found in meat, red peppers, garlic, onions, broccoli, brussels sprout, oats, milk, whey protein, and wheat germ. However, cysteine is not classified as an essential amino acid, and can usually be synthesized by the human body under normal physiological conditions if a sufficient quantity of the sulfur-containing amino acid methionine is available. The free amino acid cysteine does not represent an ideal delivery system to the cell. Cysteine is potentially toxic and is spontaneously catabolized in the gastro-intestinal tract and blood plasma. Conversely, cysteine absorbed during digestion as cystine (two cysteine molecules linked by a disulfide bond) in the gastrointestinal tract is more stable than the free amino acid cysteine. Cystine travels safely through the gastro-intestinal tract and blood plasma and is promptly reduced to the two cysteine molecules upon cell entry (Ammunotec 2007). It is interesting to note that currently the cheapest source of material from which food grade L-cysteine may be purified in high yield is by hydrolysis of molecules in human hair. Other sources include feathers and pig bristles. The companies producing cysteine by hydrolysis are located mainly in China. A source of bonded cysteine (cystine) is undenatured bovine whey protein; this is the same form as that in human breast milk. Cysteine (mostly in the naturally occurring form L-cysteine) is used for applications in the food, pharmaceutical, and personal care industries. One of the largest applications is the production of various flavors. For example, reacting cysteine with sugars in a Maillard reaction yields meat flavors. L-cysteine is also used as a processing aid for baking. Small quantities (in the tens of ppm range) help to soften dough and thus reduce processing time. The cysteine derivative N-acetyl cysteine (NAC) is often used as a cough medicine as it breaks up the disulfide bonds in the mucus and thus liquefies it, making it easier to cough up. NAC is also used as a dietary supplement as already indicated above. In the field of personal care, cysteine is used for ‘’permanent wave’’ applications, predominantly in Asia. Cysteine is used for breaking up the disulfide bonds in the hair's keratin. Cysteine is a very popular target for site-directed labeling experiments to investigate biomolecular structure and dynamics. Maleimides will selectively attach to cysteine using a covalent michael-addition. Site-directed spin labeling for EPR also uses cysteine extensively. In a 1994 report released by five top cigarette companies, cysteine is one of the 599 additives to cigarettes (Martin 2007). Its use or purpose, however, is unknown, like many cigarette additives. Its inclusion in cigarettes could offer two benefits: Acting as an expectorant, since smoking increases mucus production in the lungs; and increasing the beneficial antioxidant glutathione (which is diminished in smokers). Cysteine has been linked to aiding in the remedy of certain hangover symptoms from drinking alcohol. It directly counteracts the poisonous effects of acetaldehyde, a particularly toxic by-product of alcohol in the human body. Cysteine attracts the toxin, breaking it down into the non-toxic acetate, a substance similar to vinegar. The actual effectiveness of consuming cysteine as part of a hangover remedy is unclear (LEF 2003). Cysteine is required by sheep in order to produce wool. However, for sheep, it is an essential amino acid that cannot be synthesized by the sheep and must be taken in as food from grass. This means that during drought conditions, sheep stop producing wool. Transgenic sheep have been developed which can make their own cysteine. Ammunotec. 2007. The benefits of glutathione (GSH)]. Ammunotec.com. Retrieved March 15, 2007. Baker, D., and G. Czarnecki-Maulden. 1987. Pharmacologic role of cysteine in ameliorating or exacerbating mineral toxicities. J Nutr 117(6): 1003-10. Bulaj, G., T. Kortemme, and D. Goldenberg. 1998. Ionization-reactivity relationships for cysteine thiols in polypeptides. Biochemistry 37(25): 8965-72. PMID 9636038.
International Cystinuria Foundation (ICF). 2007. What is cystinuria?. International Cystinuria Foundation. Retrieved March 16, 2007. Life Extension Foundation (LEF). 2003. Alcohol-induced hangover: Prevention. Life Extension Foundation. Retrieved March 15, 2007. Martin, T. 2007. What is in a cigarette. Quitsmoking.com. Retrieved March 16, 2007. This page was last modified on 24 May 2008, at 02:51.